If you're in the New England area, you need to be aware of the fact that Mass Indie Film is presenting a Night Supporting Independent Film. Details are below and you can also read the picture, as I think I left it big enough to read. I should also mention that if any of you have an event or film that you want to promote, please send info our way! On April 26 At Belmont Studio Cinema, Mass Indie Film is presenting a night showcasing independent film with screenings from some of the best filmmakers in New England. 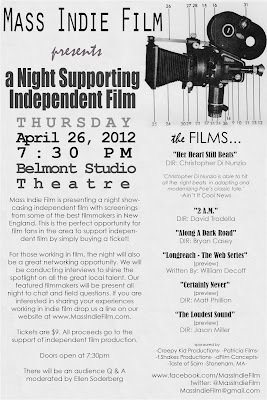 This is the perfect opportunity for film fans in the area to support independent film by simply buying a ticket. If you work in film we want to hear from you! The night will also be a great networking opportunity for people in all aspects of filmmaking. We will be conducting interviews to shine the spotlight on all the talent that independent film has to offer. If you are interested in sharing your experiences working in indie film drop us a line on our website at www.massindiefilm.com. All proceeds go to support independent film production. Doors open at 7:30pm Show starts at 8:00pm. There will be a Q&A. The budget for Wound is commercially sensitive, but lets just say it’s very low budget. Financing came from two long time friends who wanted to give me the opportunity to make Wound exactly the way I wanted. My goals with Wound were to get noticed at Film Festivals and secure distribution deals in the main territories. Two years on from making Wound, the film has achieved these goals. Wound has been selected for over 12 International Film Festivals worldwide, where it achieved good audience responses including winning Best Film , Best Director and Best Actress at the Night Of Horror International Film Festival Sydney Australia 2011. Wound was shot in 12 days over one month. This allowed for more preparation during the actual shooting which was split up into short shooting bursts where you could then focus your resources in the best possible way. My story, from Wound. Arriving at location one morning to see 20 chairs laid out in a row for the film crew to sit on to be lectured by the irate bookish home owner who informed us he had found in his house after filming, two books sitting on a window sill, that may have suffered “sun strike” damage, thus reducing there monetary value and wilful misuse of his property. Turns out the books in question were supplied by the art department and cost two dollars for twenty at the local hospice charity shop. Plus the day was overcast and there had been no sun bursting through to brighten the day yet. So because of long shooting days the home owner had become delusional. Moral of the story, securing locations are a key part of low budget filmmaking, and if you can’t afford to pay a fee for the main location and pay for the home owner to stay in a Hotel then you have to factor in the unexpected, if they are present during shooting. With the digital revolution in full swing the Indie horror film has been opportunities in front of it. Low budget Indie horror can translate to the one genre where you can make the film you want to make without having to compromise with the generally old fashioned and conservative distribution demands. Uniqueness and originality have real value in a market swamped with sequels, remakes and derivative product. Yes I am working on several new project ideas in the low budget arena. This has proved to be quite hard to do as, you need to tell a story in an affordable way on a micro budget that can crossover into the mainstream market based on your unique angle.